In the wake of Rece Davis's promotion to College GameDay and specifically so after Lou Holtz parted ways with the network in April, I thought that gave ESPN the perfect opportunity to rework their primary college football studio crew which had been defined over the years by the shtick and shenaigans of Holtz and Mark May. 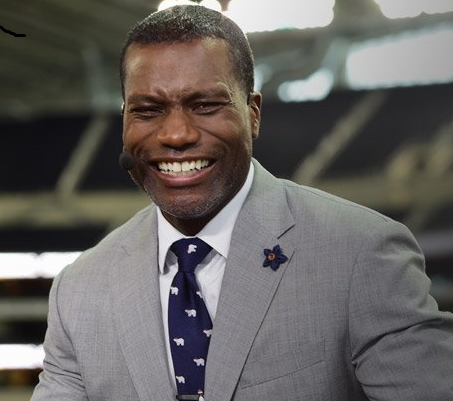 Now, as first reported by the great John Ourand of SBD, ESPN had done just that with a brand new crew: Adnan Virk, Joey Galloway and Danny Kanell. Virk has been a jack of all trades during his time in Bristol as he has hosted Baseball Tonight as well as helming ESPN's college football studio last year and some college basketball studio action, while also regularly filling in on ESPN Radio and on Olbermann, and he has excelled in all roles. It is great to see him to get one of ESPN's higher profile studio assignments and he should do well. Galloway has been working the noon ESPN2 game since 2012 with Beth Mowins and while he has been one of the more underrated game analysts since then but he impressed in the studio in the run-up to the inaugural College Football Playoff. He was somebody that I had my eye on to potentially get a promotion and get a spot on this studio team, so look at that. Kanell has seen his profile rise at ESPN during his few years with the "Worldwide Leader" as he has gone from doing Saturday afternoon games in 2012 to working the Friday night contests the past two seasons and spending last season in the ABC studio alongside John Saunders and Mack Brown. He is somebody whose analysis I have enjoyed although he got some criticism last season for picking up some anti-SEC shtick. All in all, I think this studio team will be much improved from what it has been over the past several years. It may not be able to get the message boards and the Twittersphere as riled up as May and Holtz were able to do but I think ESPN would be fine with that. As for May, he will be sliding into Kanell's spot with Brown and Saunders for what will presumably be the ABC studio crew (although Ourand's report does not state that explicitly). I, for one, would hope that May would finally end his troll shtick because outside of that, I don't think he's that bad of an analyst. With UAB football coming back, what's next?